A few weeks ago, I had the most delicious samosas at the White Horse. In the days after, I couldn’t stop thinking about how tasty they were and set out to try to recreate them at home. Once I got going, I realized that I hadn’t paid very close attention to what was actually IN the samosas or its chutney companion, making recreation a difficult task. Instead, I decided to use fillings that I thought would be tasty and easy. While they were not THE SAME as those at the White Horse, they were still mighty delicious. This recipe covers the basics of samosas – a flavorful combo of peas and potatoes, spiced, and tucked into a pocket or turnover. To make things easier, I decided to use puff pastry dough. While this is a great shortcut, puff pastry is not super low in calories. Still, for a weeknight dinner, convenience sometimes wins. To add a bit of protein, I went with garbanzo beans (also known as chickpeas) instead of meat. If you prefer, a bit of spicy sausage instead of the garbanzo would be a good substitute. The filling only takes a few minutes to make and assembly is easy. This is a recipe that requires little prep work and tastes delicious. I’ll definitely make them again. In a microwave safe bowl, add potatoes and cover with water. Microwave on high for 5 minutes. Remove from microwave, drain, and mash with a fork. Set aside. In a skillet over medium-high heat, add oil. When oil is hot, add onion and garlic. Saute for a few minutes until onions start to turn transluscent. Add potatoes, garbanzo beans, frozen peas, water, and curry. Reduce heat to low and cook until most of the water has evaporated. Take a square of puff pastry dough and place 1/4 c. of the samosa filling in the center. Wet the edges of the pastry dough with a little water, then fold over to form a triangle. Press the sides together to seal. Repeat with remaining pastry squares, placing each one on the baking sheet. Bake for 20-25 minutes or until the pastry is light golden brown. – I would highly recommend serving the samosas with a side of chutney. I used the Apple Chutney I made a few weeks ago and it was a delicious side (68 cal/quarter cup serving). Store-bought chutney would be totally fine and would save you some effort. – I was starving and baked this batch until they were done, but not totally golden. While I ate one, I baked the others a bit longer and they looked better. This photo shows them a bit on the pale side, I’d wait until they are a bit more golden than that before removing them from the oven. Samosa’s are one of my favorites but I hate working with pastry. I think I just need a bigger kitchen! Yosef, me too! 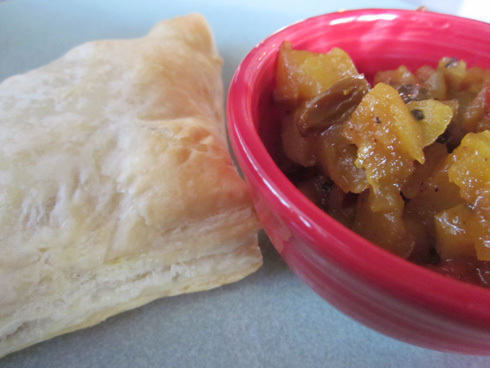 I loved using frozen puff pastry for this – it was super easy. I assembled these in a fairly small area, I wonder if it would work for you?